New year, new blog, who needs another one? Most of us love the fresh feel of a new year, the smell of a new book, the welcome of a new notebook that is unspoiled with bad handwriting. I have thought about starting a blog for over a year and many times I’ve thought, I really don’t need another thing to write, another “have to” in the back of my mind, another thing to keep my cramped arm typing on the computer. And yet there have been many times I’ve thought, ah, now if I had a blog, I would write about that. And see if anyone cared. And writer/authors these days are supposed to have something called an “author platform,” a place to connect with audiences and to keep them from their latest book or other project. So here goes. I aim to post once or twice a week, and share things from my kitchen (or from others) about that often, learning as I go. Like I’ve got some tweaks to make to these pages but have patience. For now, here is a recipe marrying some down home Virginia cooking with fine cuisine–a harmony of sorts. At first glance, you might think: sausage gravy? On pancakes? How starchy and calorie and fat laden is that? 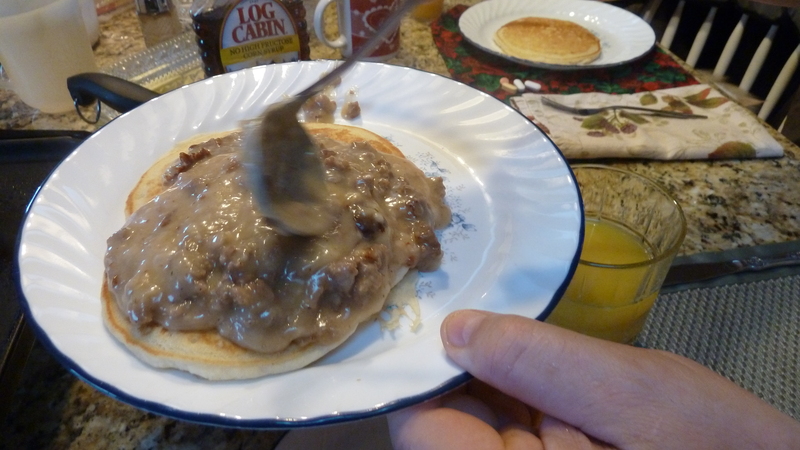 I never tasted sausage gravy until my husband joined the Lions and I watched Lion John Knepper in Broadway make this in endless supply for the Lions annual pancake days. I like to think of this as a fine French sauce on thickish crepes! Here is a modification of his recipe, just enough for the two of us. Saute sausage in fry pan, chopping in to medium fine crumbs as it cooks. Remove cooked sausage. Brown 2 Tb. of the flour in the remaining grease, or if there isn’t much grease left in pan use 1 Tb. of Crisco. While the flour is browning, make a white sauce by putting the remaining flour into a plastic shaker thing (like an old Cool Whip container), and adding the water (cold). Shake til the flour is dissolved and smooth. When the flour in the pan is brown and hot, add the white sauce mixture to the pan. Stir and press out lumps if they occur. Add salt and pepper. Keep stirring until it bubbles up and thickens. If you want a thin gravy, add more water or even milk if you want. Cook for at least several minutes to let flavor seep through. You can make your pancakes while that simmers. Serve hot on top of fresh pancakes, crepes, biscuits, toast–whatever you want. Let me know what you think! Looking forward to your posts, Melodie! Thanks, I’ll check out your blog too. Con mucho gusto. Hi Melodie – thanks for liking and following my blog. I look forward to seeing more from you too! Likewise. Looking forward to hearing from you and hope Sacred Pauses goes well. I hear it is “in the house” — first copies have arrived. Have you received yours yet? Soon!